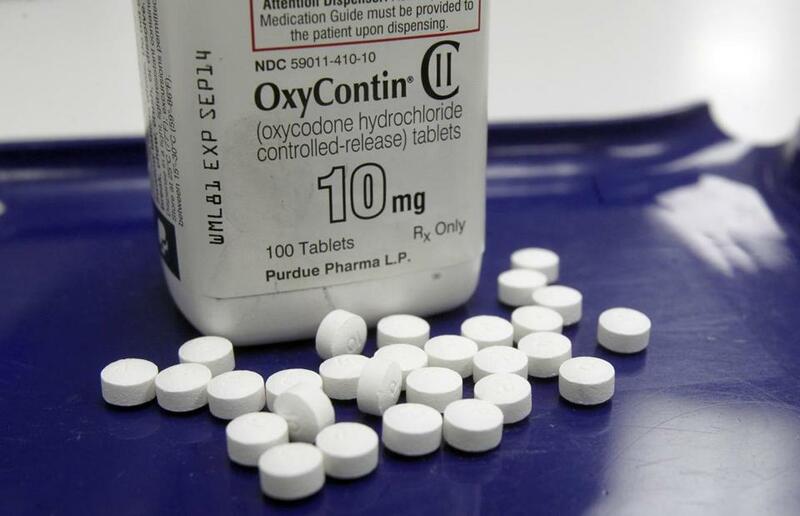 OxyContin contains oxycodone, which is an opioid. More than 90 percent of people who survived a prescription opioid overdose were able to obtain another prescription for the very drugs that nearly killed them, according to a Boston Medical Center study of chronic pain treatment published Monday. Amid nationwide alarm over soaring overdose deaths, the study in the Annals of Internal Medicine is believed to be the first to ask: What happens to those who survive? The answer, in the view of lead author Marc R. Larochelle, is stunning. Larochelle speculated that the doctors writing those prescriptions didn’t know about the overdose. Charlie Baker’s legislation would grant hospitals the power to force addicts into treatment — the House bill wouldn’t do that. The findings suggest major gaps in communication, education, and oversight that persist despite widening concern about the overuse of opioid painkillers, specialists said. Dr. Jessica Gregg, author of an editorial accompanying the study, said her initial reaction was to think the doctors were lazy or incompetent for prescribing opioids to patients who had overdosed. But in fact, the doctors work in a system that virtually guarantees they will make such errors, because there is no comprehensive mechanism to alert doctors when a patient overdoses, said Gregg, who is addictions medical director of a Portland, Ore., clinic. Last year in Massachusetts, more than 1,200 people died after overdosing on prescription drugs or on street narcotics such as heroin. The number who die from overdoses is “the tip of the iceberg,’’ Larochelle said, and the number of survivors is many times greater. To learn more about those survivors, Larochelle and his team plunged into a national database of insurance claims for 50 million people filed between 2000 and 2012. They identified 2,848 patients ages 18 to 64 receiving opioids for pain — not including cancer pain — who survived an overdose, and examined the prescriptions they received two months before and up to two years after the overdose. The researchers found that in the week before patients suffered overdoses, painkiller dosages increased sharply, suggesting a worsening of pain or cravings. Just over half were also taking tranquilizers. After the overdose, about 10 to 15 percent discontinued opioids for a time, but even most of those patients ended up with another prescription three months later. One-third of all patients who overdosed continued on very high doses. And 7 percent overdosed again. Because the data were limited to insurance claims, the study had no information on people without insurance or covered by Medicaid, Medicare, or the Veterans Health Administration. The data also don’t track medications paid for in cash, including those purchased illegally — although many addicted to street drugs started out with drugs that were prescribed. The data could not answer why people overdosed and yielded little information about whether patients received treatment for addiction. Physicians may have no way of knowing that their patients overdosed unless the patient volunteered the information, which many would be reluctant to do, Larochelle said. In his own practice, he said, he would find out if his patient’s overdose was treated at Boston Medical Center, but not if the patient was taken to another hospital. The study suggests several ways to address the problem. The prescription monitoring programs that most states have established to track addictive drugs could be revised to include information on overdoses. Insurance companies could alert physicians when they receive a claim for overdose treatment, or require prior authorization for any opioid prescription written after an overdose. Gregg, the editorial author, said pain and addiction are time-consuming, chronic diseases that often occur simultaneously.